Help Patrick and Emily navigate the choppy waters of a new marriage! 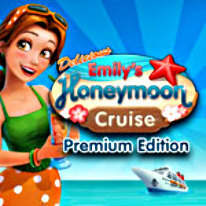 Emily and Patrick set sail for their long-awaited honeymoon in the all-new Delicious - Emily's Honeymoon Cruise Platinum Edition, an exciting time management adventure where it's anything but smooth sailing. The newlyweds soon find their expectations for married life are different. Follow the newlyweds as Patrick and Emily embark on their celebration cruise. Sailing off into the horizon of wedded bliss, Emily soon discovers she doesn't know how to relax and she certainly isn't used to having others take care of her. To make matters worse, when Patrick tells her he's excited to start a family as soon as possible, Emily's response is tepid - she's not sure she's ready for that just yet. Can they find a way to be happy?